Additional seats have been made available for Pompey's clash against Plymouth Argyle. Around 600 tickets can be purchased in the Milton End for the League One fixture on Saturday. It comes after the Pilgrims failed to sell out their away allocation for the game. Tickets can be purchased from the Blues' Anson Road ticket office or by clicking here. Kenny Jackett's troops bid to continue their unbeaten start to the season against their port rivals. 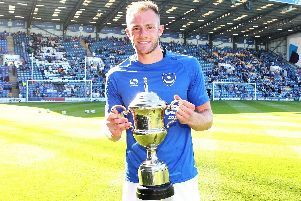 Pompey won last season's meeting against Plymouth at Fratton Park, with Kal Naismith netting the only goal of the game.